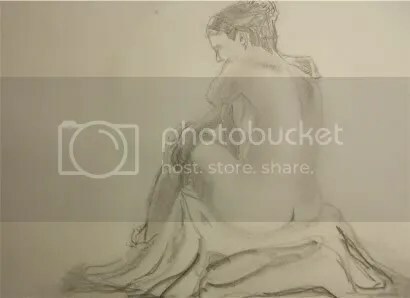 This quick sketch was made several weeks ago in my life drawing session. I think it was a 15 or 20 minute pose. This is for sale for $25.00 the size is 9 by 11 on sketch paper. This is painted wet into wet. The background is painted first then allowed to dry. 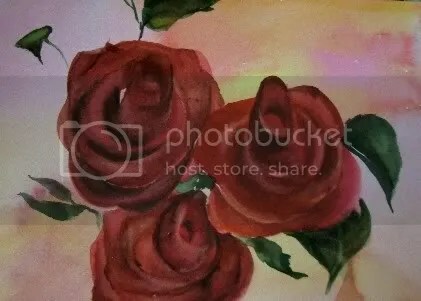 After it is dry, you paint the roses wet into wet. This means you paint one petal at a time and introduce very dry paint into the wet paint ( Say the dark red into the lighter red to form the interior of the rose,) then this is allowed to bleed. You pull out the lights and your done. Its mostly stoke work, another way would be to double load your brush and form the petals with the dark side forming the interior and the light side of the brush forming the edge. You can add leaves or whatever when everything has dried. In looking back over the last several paintings I can see that I’m painting from a different place. I don’t mean a physical place but a mindset. I’m distilling scenes and not literally painting them. As a daily painter with more than 200 dailies painted so far, I can see trends and attitudes reflect back to me from my work. Its interesting to see the subtle changes taking place. Every once in a while, I do a commission and then it seems like its all technique. These little daily paintings allow me the freedom to paint anything, really anything can be worthy of being the focus for the day. 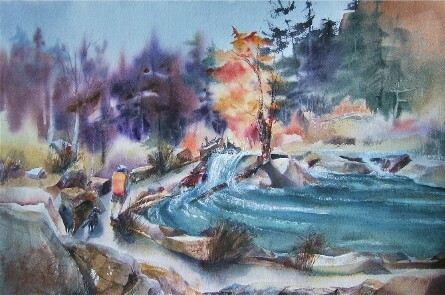 This freedom to paint anything also allow you to explore various things you may not in larger works. You are more adventurous and less predictable. Its as if we have been trained(even as artists) to do what you know works. With the dailies its a bit different, you don’t really loose anything, the supplies are minimal, the time only an hour or two, so you might explore the way light recedes thru the woods or you may try to push texture, hue or chroma. You may push it too far and figure out whats too much, all the same your work doesn’t suffer because its just a wee little painting and there is someone out there who will love it. This need to explore and test is an important element into developing your style. You’ll know when it speaks to you, you’ll respond to it, & then, you’ll know this is also your voice. An artist’s journey isn’t much different from others, it just takes a few more twists and turns, that’s all. “Calmness” is a small painting and will be for sale for $40.00. size is 10.5 by 5 inches. 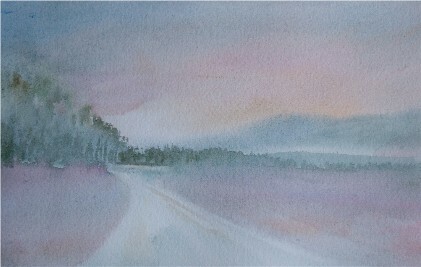 This painting is the other half of Evening news I painted earlier in the week. Some people like to paint with a lot of rules, not me. I have found I will do just about anything to save a painting. This may even mean I will use other types of medium ( OMG) . 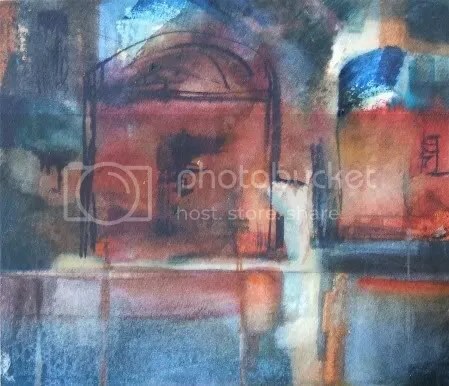 Or heaven forbid, using white… If something doesn’t work, like in this case, I’ll crop the painting, this is a bit easier for watercolorists then say oil painters but I believe most people would do it to save a piece. I always plan to paint a perfect masterpiece every-time, but it doesn’t always work out that way. I can see if something is working or not. I think its just as important to figure out what wrong with a painting and make it right as it is to do it right from the start. So here is a little painting that I cut off of “Evening news”, by changing the dominance and by bringing in some calligraphy I think it works. the size is a bit small at 4.5 by 3.5 so its only 20.00. what a steal! This is a bit larger then the daily paintiings and is for sale for $250.00 This is half price so if your interested you need to email me soon, as this one will go fast. size=15 by 22 … 7.50 for shipping inside USA. All other countries will have to be calculated. I like the idea of a man and his dog walking along a dirt trail in the woods. After yesterday’s hard edge bright painting, I did a three sixty and painted this soft edged very light landscape. There are so many different ways to paint something, I have found I have a very distint style and yet I still like to try on other types of painting styles and techniques for a change. My style actually is very bright with lots of darks for contrast. To paint this little 6 by 9 inch painting, in the wet in to wet style is about as far away from my personal style as I can go.